The other side of the leopard – WCW leopardproject: understanding, education, conservation. Step by Step. It is obvious that the leopardspecies still is far less understood,and misjudged, compared to all other species. In the wild they for sure are under threat, but also in captivity lots can be improved for the species. There’s so many studies, so-called facts or scientific documents about the leopard. To start another project is only adding when one does something completely different, trying to show the other side of the medal….So much more to the leopard as we found out already………..
As for a wild leopard, it won’t be happy and never will be captured and caged. If an organisation or zoo refers to this as a rescue, because they are not killed but kept in a cage instead….better to let him go, he will never be happy and never be as relaxed as a captive born leopard. In Wild Cats World I not only wanted to give the best home possible to a few (captive born) ambassadors of their species, but to contribute to the understanding and conservation of the species and to try to reach the impossible, the construction of a “leopard Pride” started and an “experiment”, who has proven so many scientific or zoological facts and stories about leopardbehaviour wrong already, which will be documented step by step, a few highlights of the project and experiment presented already on this website…. 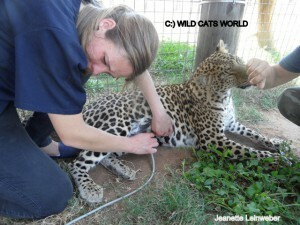 Phase I – WCW leopardproject: understanding, education, conservation. The other side of the leopard. As said our Leopard Conservation Project not only focuses on the leopard in the wild, but also on how to improve the lifes of captive born leopards, with as main goal: a better understanding, education and eventually contribution to the species in their natural habitat. 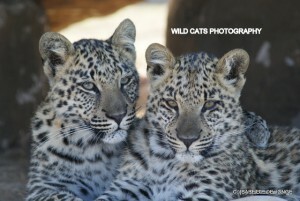 After studying the leopards in their natural habitat as well as in captivity, it was time for our project. But how did it start and more important which so-called scientific “facts” and publications of the leopard and their behaviour can we already deny. – Are leopards solitary and not living in peace with other leopards? WCW: if enough space and food, no problems at all, not in our project but also not in the wild we experienced. WCW: They have the name, but also in the wild they tend to become less and less elusive, more often great leopardsightings everywhere. – Do males fight over territory and females? WCW: Not when enough space and food. We now even observed how males do share females. Not at the same time but each their own period. – Do leopards kill other leopards, like unrelated cubs? – Are humanraised leopards more dangerous and not capable of living with their own kind anymore? WCW: Not true! – Are sexually mature leopards more dangerous to humans they bonded with early on? WCW: treated the right way: NO! Males do even see the difference in men and women and react to that. 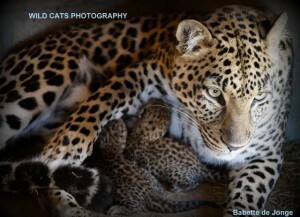 – Are humanraised leopards able to raise cubs themselves? 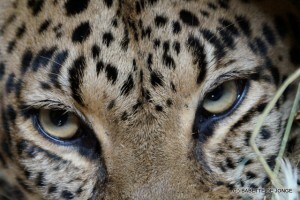 – What about the wild instincts of leopards in captivity? – Are leopards more dangerous compared to the other big cats? WCW: not at all, but they are the true cats amongst the big cats, and on top of that: opportunistic and clever! So not a match for ignorance and stupidity, but not more dangerous from birth. All of these subjects will be worked out in the future document (book) about the whole project. It started ages ago already by the observation of leopards in the wild, but also in zoos and sanctuaries…..The leopard conservation project officially started in 2010, and in 2011 we decided to do one project with ambassadors, Feline being the first to arrive. Our four leopards were sadly taken away from their parents and offered for sale, for anyone interested: so also canned hunting industry. Even though it is tempting and a wonderful feeling to be a sort of “surrogate” parent to a leopard, this was not our intention. We wanted to keep the bond but above all to reunite them a.s.a.p. 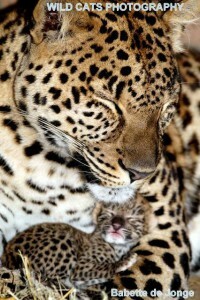 with their own kind, to be leopard and not humanized. Felix, Feline’s brother, was still on the list after 3 months so we decided to reunite him with Feline, and when they were young adults first Felipe and a year later Felicia were introduced to them as cubs with no problems at all. 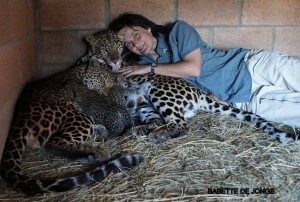 They all loved to be with leopards, and the huge “homes” (connected for enrichment) we had constructed for them is benefiting to their happiness. The experiment started along the way, to keep them as sort of a Pride. In fact the 4 leopards initiated themselves to this…..always looking for each other’s company…in good harmony. And there’s enough space to have private moments as well. In these 5 years we learnt so much about this incredible species, and the best education is to share this info with everybody who is interested and above all who has the wrong idea about the leopard. Monday, 19 October 2015, was a very exciting day for all at Wild Cats World and our vet, but also another very important achievement in our leopard project “The other side of the leopard”. Our dear ambassador leopard, Queen Feline, was examined and we decided to have a scan done to know a bit more and check if all is fine…..and yes Feline allowed this, caretakers by her side and a vet (and assistant) she never saw before…..NON sedated! Lots of domestic cats can take her example of behaving so well!! 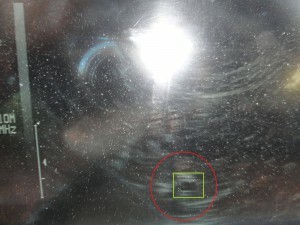 All excitement grew when…..one….two heartbeats were visible. 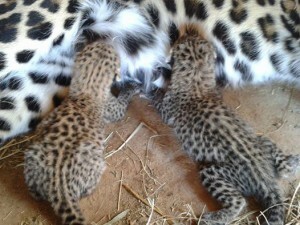 These cubs are most welcome and very important for our project. Of course it is a first litter so we hope all goes well, but for sure Feline will be a wonderful mommy, already practicing her skills on Felicia who allows it. The cubs will be (of course!) mother-raised, and part of the leopard “Pride”-model. Interesting to see how mom Feline reacts to the people she bonds with when she has cubs. We expect no change! Important for the project to see the differences between human-raised (but soon reunited with their kind!) 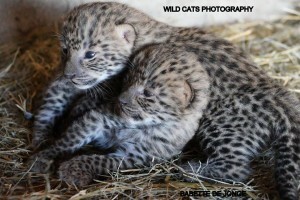 and mother-raised leopards, and above all to show the other side of the leopard again. The species that is so misunderstood, and turns out to be most exceptional and wonderful of all!! Pictures kindly taken by our caretaker Jeanette Leinweber. 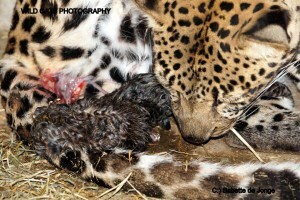 Early Wednesday morning, November 4th, 2015, our dear leopard female Feline gave birth to two gorgeous, dark spotted, cubs. Daddy of the cubs is our male Felipe, who in time will be introduced to his cubs as well as uncle Felix and (surrogate) “sister” Felicia, the other female in our project. Before giving birth Feline was practising on Felicia, caring for her and intensely grooming her. The two cubs are very welcome in our project, as they are an essential part of our leopard conservation & education project, and of our ” experiment” of keeping leopards in a sort of Pride. Feline is an exceptional mother, and the cubs drink well and are very active. For now peace and quiet for them is most important! To all people who like to work in a different way than I do with WCW, with their educational and conservational projects and purposes, who will judge before knowing or who just envy and therefore judge, just this one time short & clear explanation and message. No one has to agree, but it is not all black and white. Of course I don’t advise people to do what I do just like that…..let that be a warning. The whole message in what I do and experiment in our leopard project: all once said or claimed as facts about leopards can be taken into consideration. These are not ordinary cuddle picture I at times share with leopards in our SA project, but this is a human who after long dedication and input, is able to be with a leopard who gives birth, who accepts the presence close of a human and another leopard, with the cubs close…….this is what isn’t advised anyone to do, but to take into consideration that this species needs to be loved and saved as all knowledge that has been spread of the leopard being the most vicious, a-social etc etc cat is just not all true. They are not just dangerous, solitary, nocturnal and whatever…..And also in captivity you must not let them be wild and put them in a small cage. In fact (many) zoos, sanctuaries and private projects can learn a lot from this project too. Only frustrated females (and males) are afraid of caretakers and do kill their cubs. To South African projects and some zoos: you don’t have to take cubs away in order to have them get used to humans (or socialize them). Many people are doing this kind of work and trying to give this message with cheetah, lions, tigers…never leopards, so not anyone is going to destroy the one clear message we are sharing…..and apart from that our mutual love and respect! And yes I do it for myself too, as it is so rewarding so see animals like leopards so much at ease in every way, as they are respected and loved but also can live like leopards…not like pets or zoo/circus entertainment. All in my power I have given and will keep on giving to this species, also in the wild. Don’t underestimate that. Thanks! Leopard Conservation: New: WCW against trade, commercial exploit, Canned Hunting and irresponsible breeding of leopards in captivity. 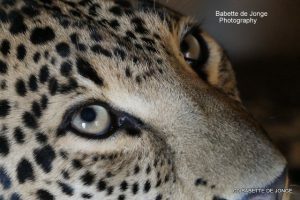 With our leopard project and leopardambassadors we raise awareness & share knowledge as for leopards and leopardbehaviour. Enthusiasts are offered a chance to volunteer/work closely (not hands-on) with our leopards to get to know them better, love them more and so support their protection. Without being exploited and ripped off themselves!! We do support the survival of leopards in their natural habitat, but also work hard to improve situations for captive leopards. Yes we know there’s stil a lot of people claiming leopards and other animals shouldn’t be in captivity and cannot thrive there, and yes in an ideal world we agree to this 100%. The ideal world and huge habitat to live a long and healthy life in the wild sadly doesn’t exist anymore, and as long as the wild ones have difficulties to survive there, no use to put captive borns not used to the wild life in danger too (apart from a life in a Reserve, so lower scale…free ranging). BUT there’s still a lot of captive borns that aren’t kept in a proper way, lots of breeding and trading by breedingfarms without purpose and without aim to conservation. Yes we do breed on low scale…..responsible way…..for many reasons. First of all not to derive our leopards from anything (within our reach that is) close to the life they would have in the wild. 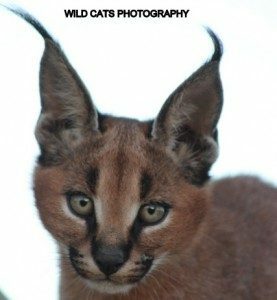 Further on with a purpose….apart from education and raising awareness, also as a weapon in the new project to fight commercial trade and breeding in captivity (also affecting the wild population). Projects, Organisations (preferably in South Africa) and Private Game Reserves who want to start with leopards: stop buying them from breeding farms, stop buying wild leopards offered by farmers catching and selling them….stop paying full stop to get leopards. 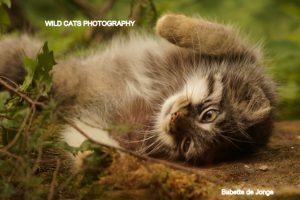 INSTEAD: do contact us on info@wildcatsmagazine.nl. 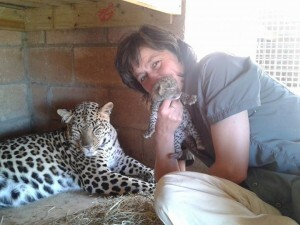 We can help you on a non-pay base but with rules: no breeding and giving the best life possible to the leopards. If you want to learn more write us. But please stop encouraging the irresponsible breeding programmes, the inbreeding, the trade, the canned hunting of leopards!!!! !